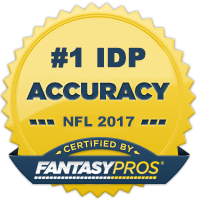 I thought it would be fun to start a series entitled "IDP Showdown" in which I compare two IDPs who have very similar ADPs. Each player will be judged on five different categories: Tackles, Sacks, Opportunity, Health, and Safeness of the Pick. Tackles: Kiwanuka is a very strong tackler for his position. He had 60 total tackles last season as a rotational pass rusher. The Giants have been experimenting with him at strong side linebacker and I expect very healthy tackle numbers. I don't see Campbell outproducing him in this category. Sacks: This is a close call. In Kiwanuka's only full season, he put up 8.5 sacks. I forsee similar numbers this season. Campbell had 6.5 sacks last year and given his upward trajectory, I could see around 8 sacks. I will call this one a draw. Opportunity: I give the slight edge to Kiwanuka on this one because he plays RDE on a 4-3 defense whereas Campbell is a LDE on a 3-4. They both will rotate about the same amount. However, I believe the Giants are going to put Kiwanuka at linebacker for a few snaps each game giving him the advantage in this category. Health: Both players have been healthy throughout their careers and aren't considered injury risks at this point in time. Safeness: Both of these players are fairly safe picks at a position that is lacking in fantasy depth. WINNER: I give Kiwanuka my vote. He's just as safe of a selection as Campbell, but he has higher upside. He's the starting RDE and will also probably see some snaps at SLB. He's on perhaps the most talented defensive line in the league and should see plenty of one-on-one matchups.